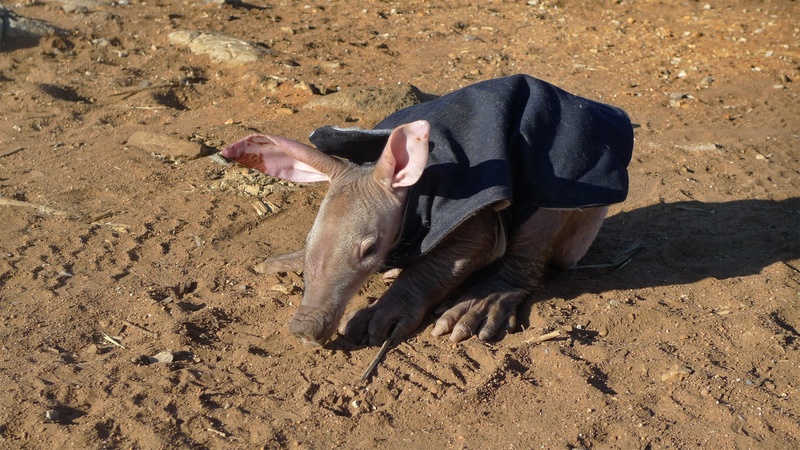 ET was brought to ZURI Orphanage in September 2015 by one of Erika‘s veterinary clients. 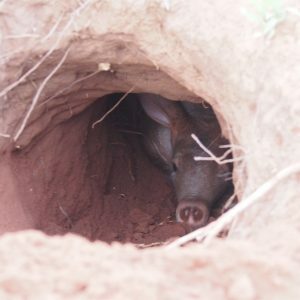 He was picked up by a lorry driver about 600 km away from Tsumeb when the driver checked the tyres of the lorry in the morning. 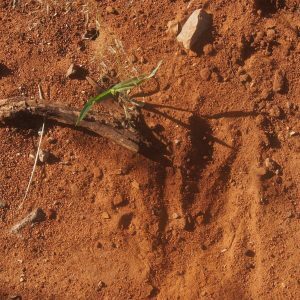 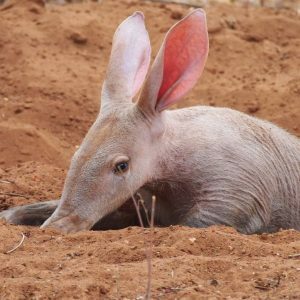 He found a little baby aardvark behind one of the tyres and if he did not check and walk around the truck, he would have driven over ET. 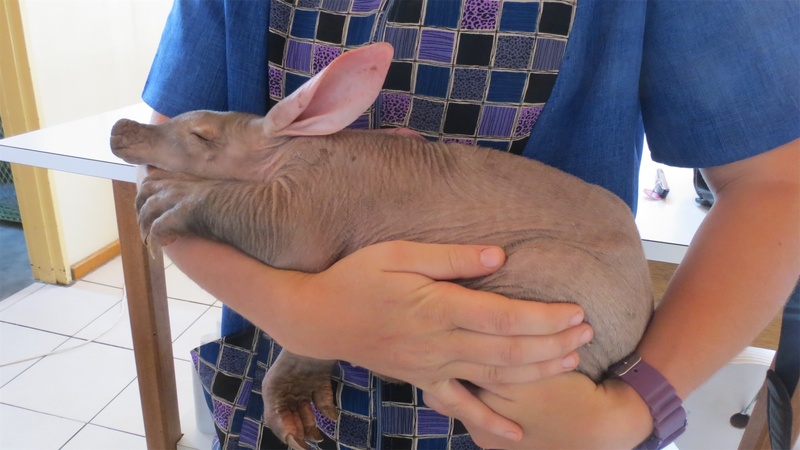 For everyone at ZURI it was love at first sight. 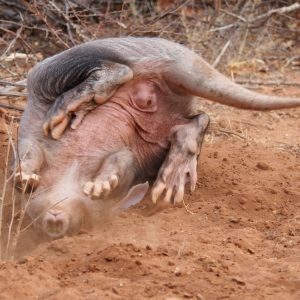 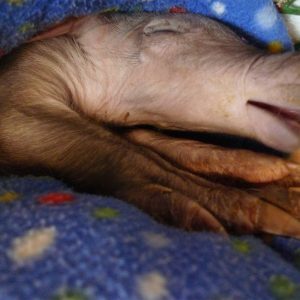 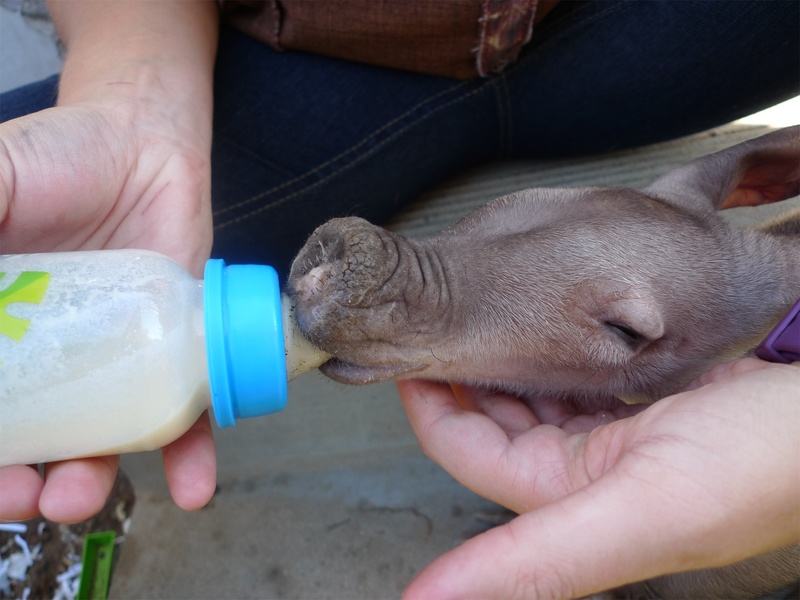 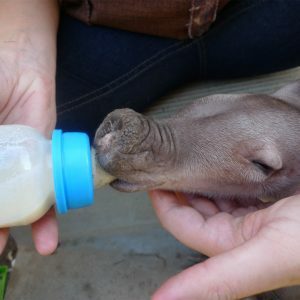 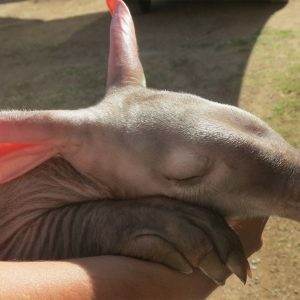 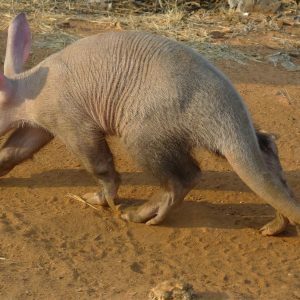 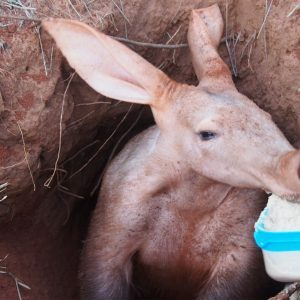 It was the very first time that most people in Tsumeb had seen a baby aardvark and ET quickly became a celebrity. 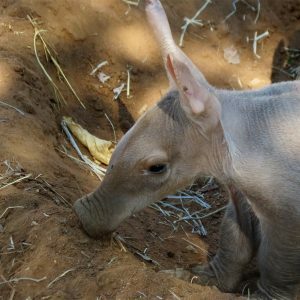 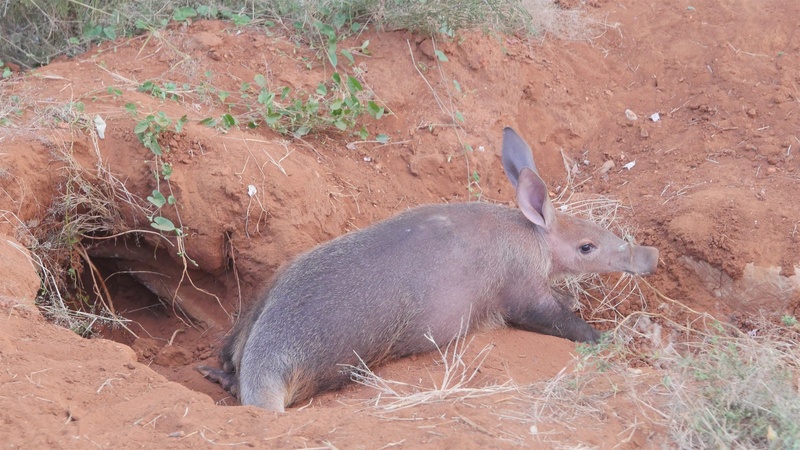 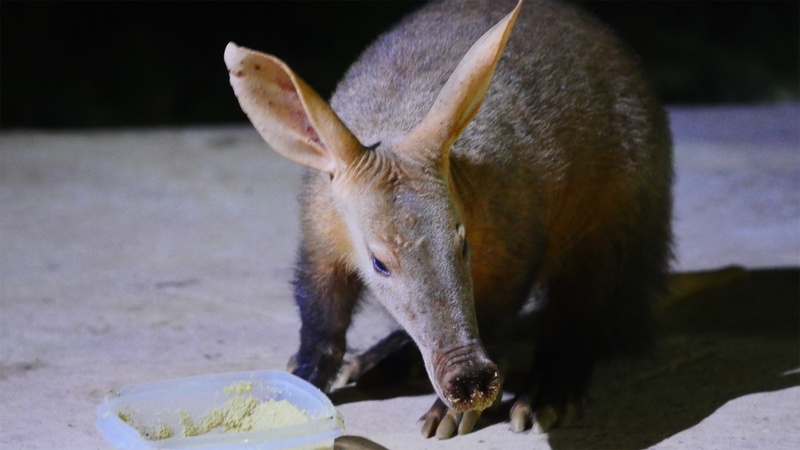 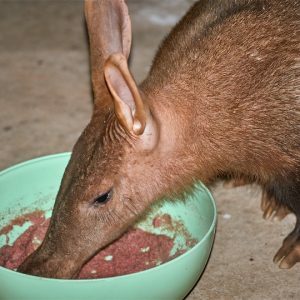 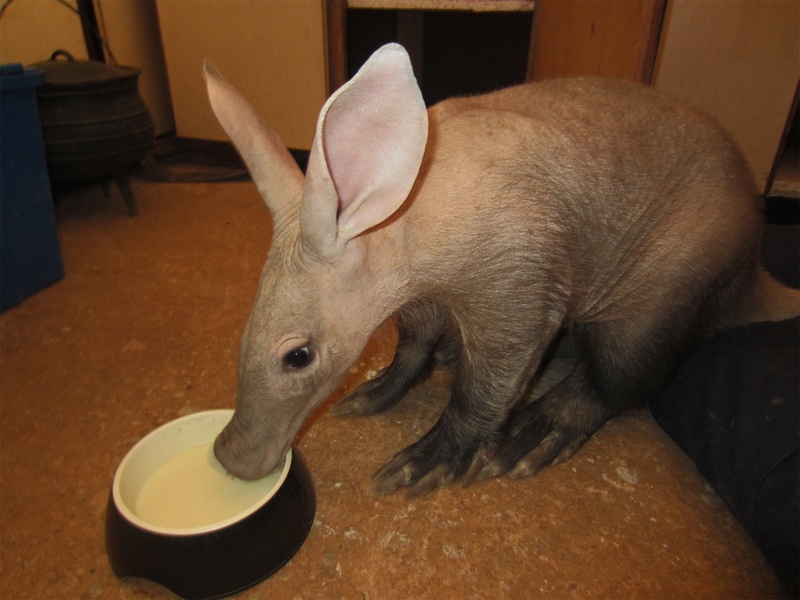 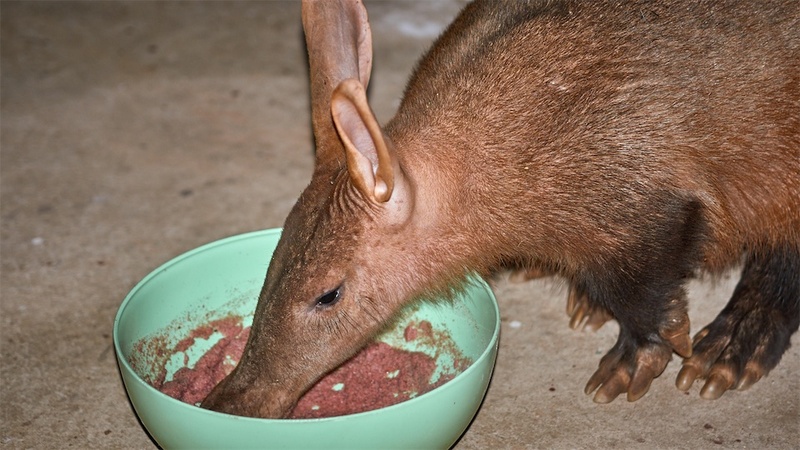 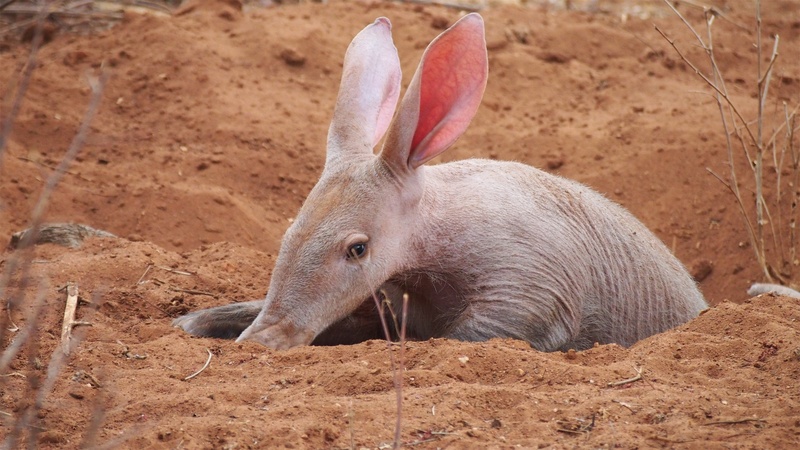 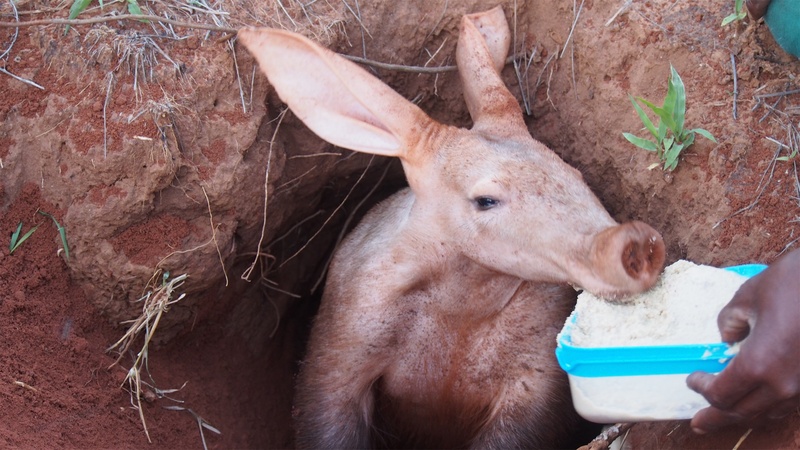 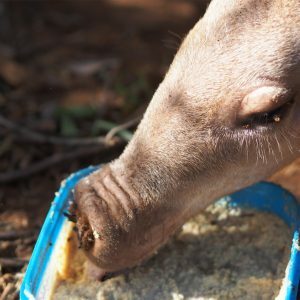 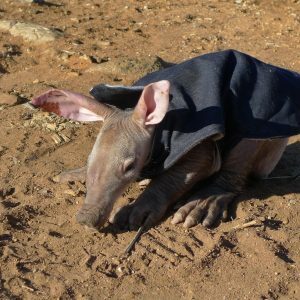 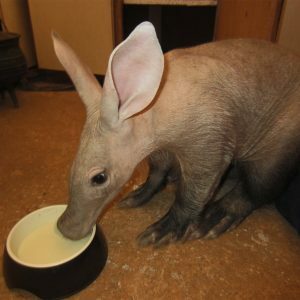 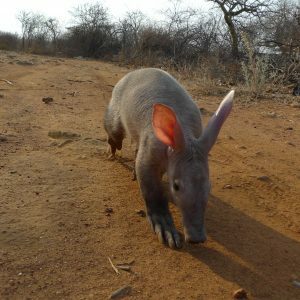 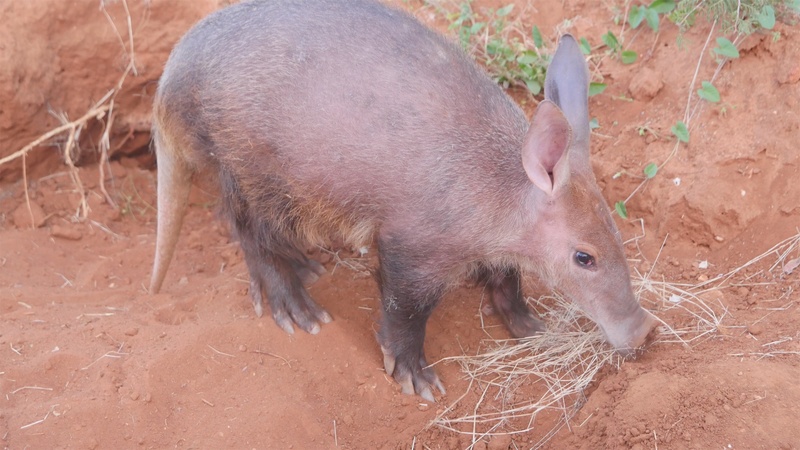 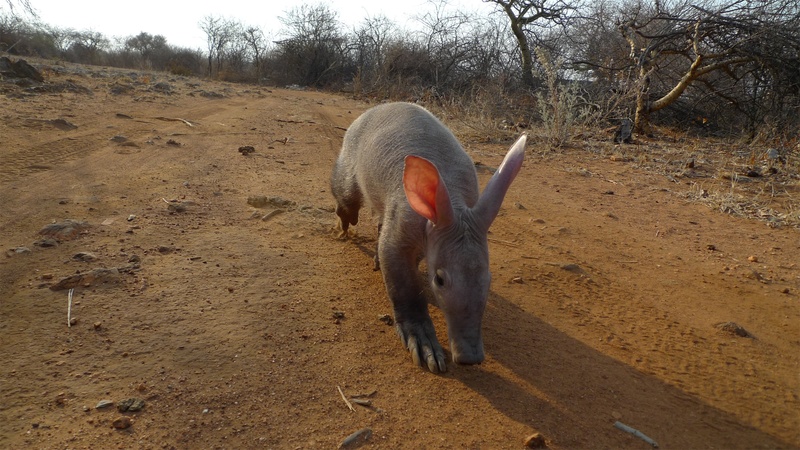 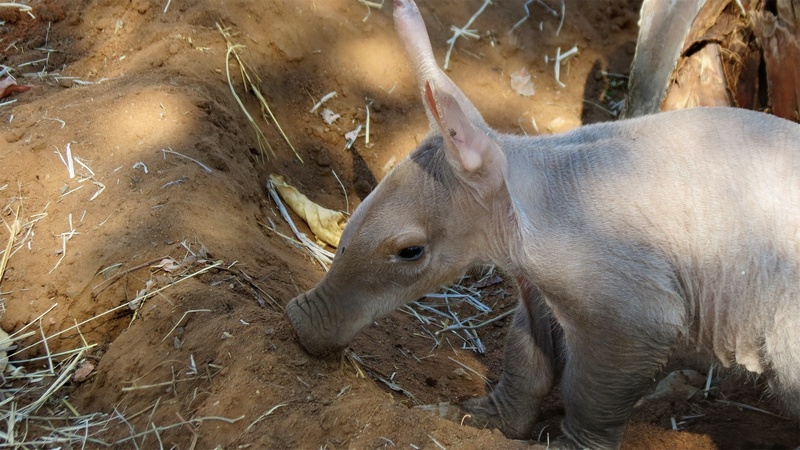 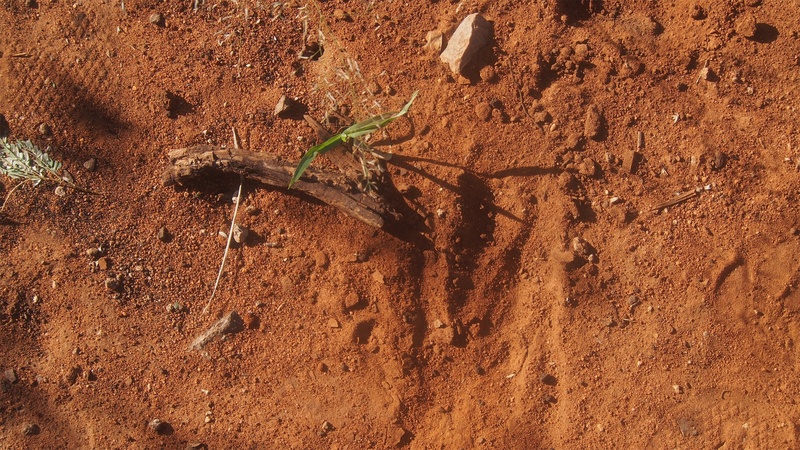 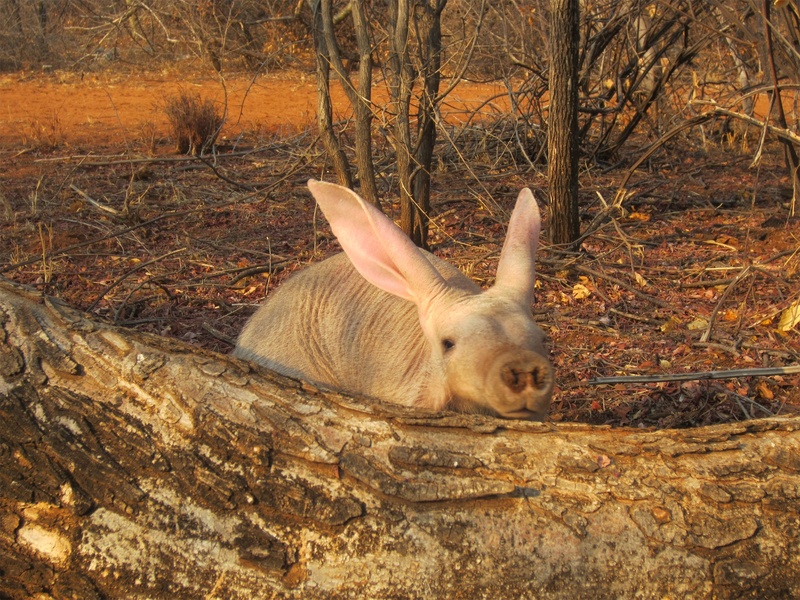 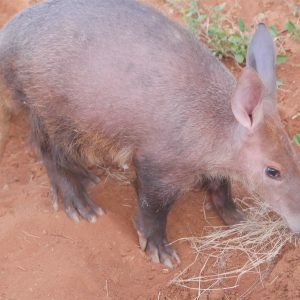 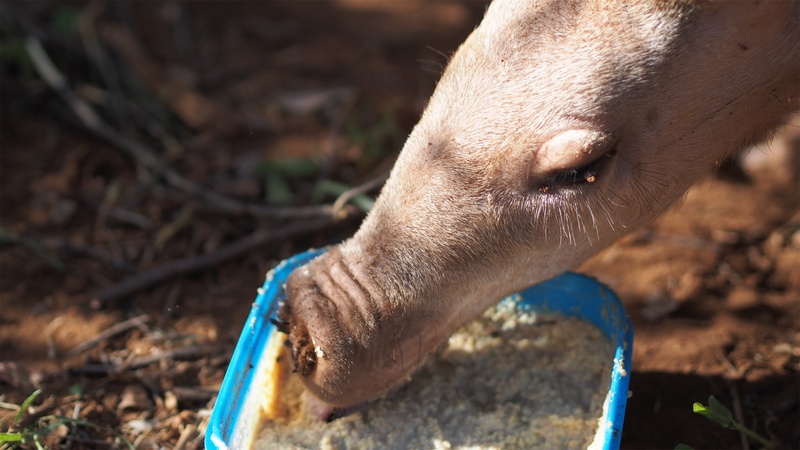 The team at ZURI named the little aardvark ET as he closely resembled the little character of ET in the famous movie. 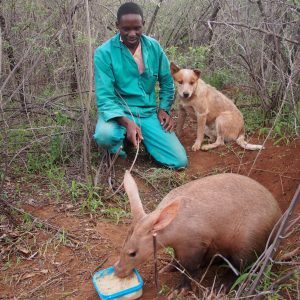 During his first months he travelled to the veterinary practice every day and in the evenings back to ZURI farm. 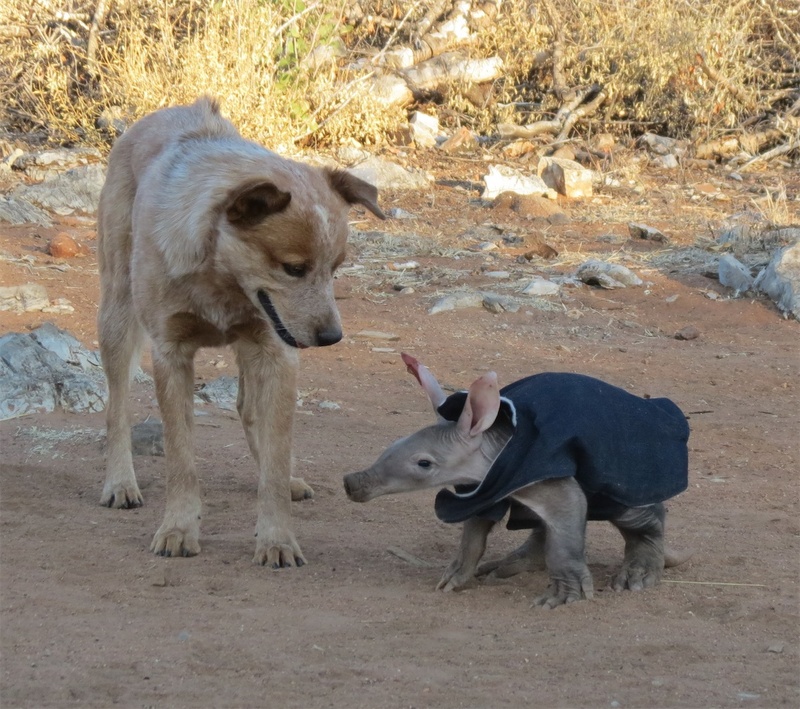 ET went for walks with the dogs on a daily basis and quickly became adapted to life with dogs and cats on the farm. 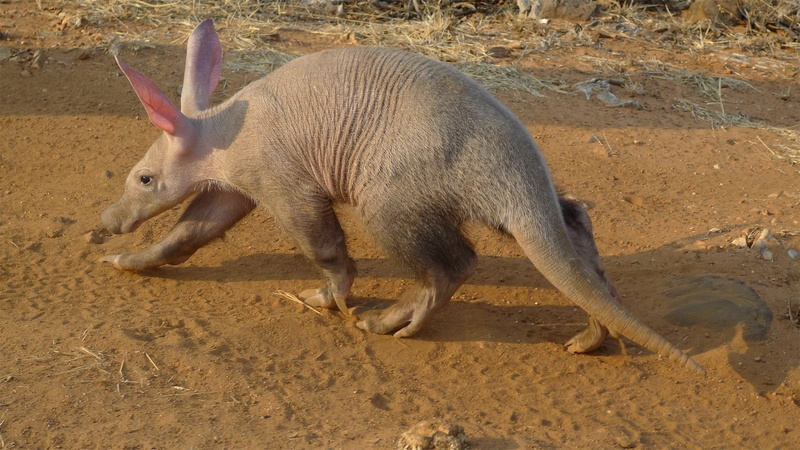 During the rugby world cup he was featured in many publications when he was photographed during a Springboks game with a South African flag painted on his back with face paint. 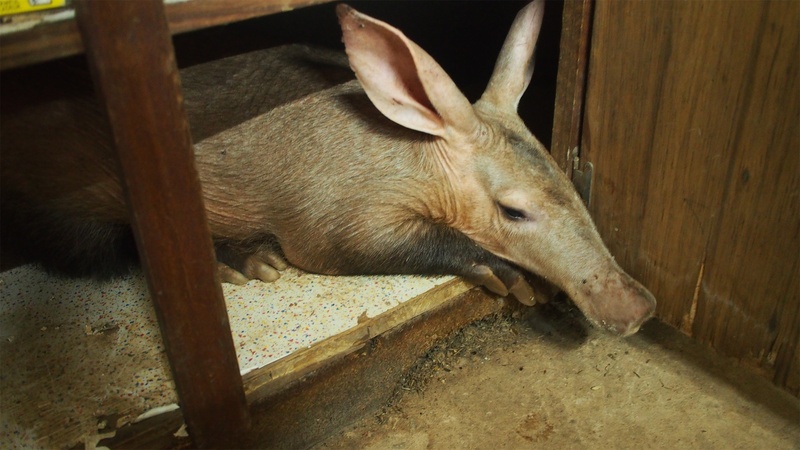 As ET became older and heavier he moved into the bottom of the kitchen cupboard which resembled an “aardvark cave” to him. 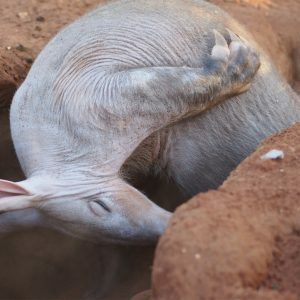 He lived there for a couple of months. 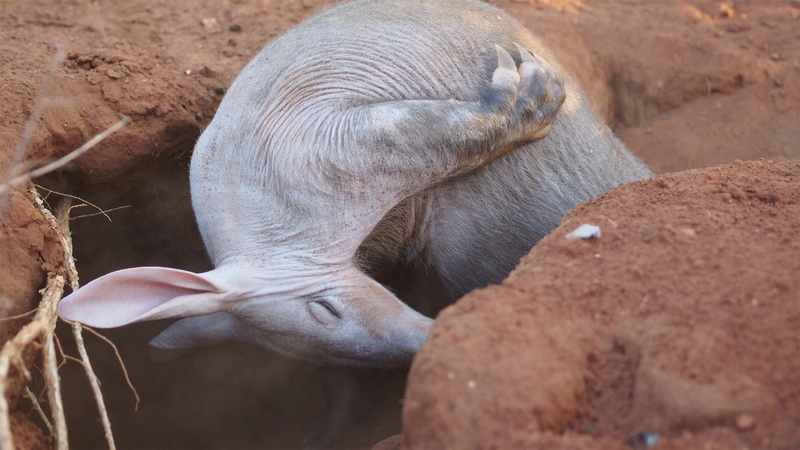 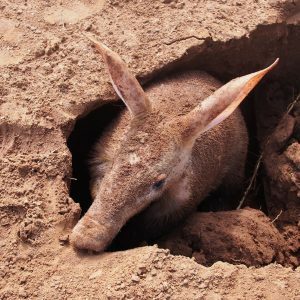 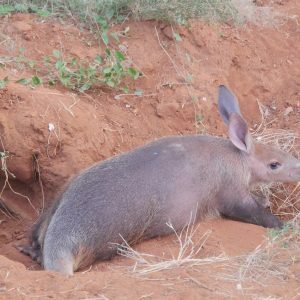 During this time the ZURI team took him to an old aardvark hole where he could spend a couple of hours digging every day and get fit. 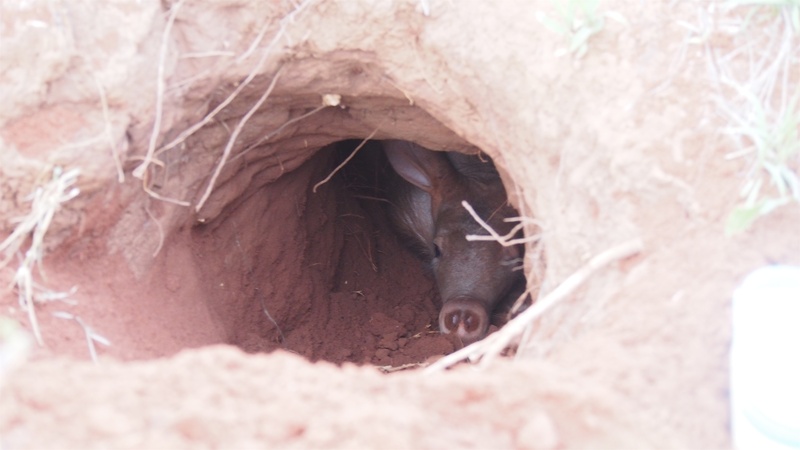 When the time came he spent his first night on his own in the hole. 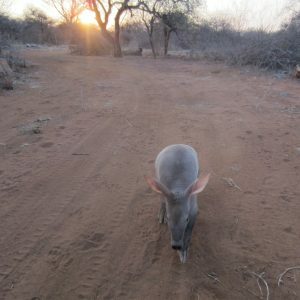 We put cameras up to monitor him and the next morning we went and fetched him for breakfast. 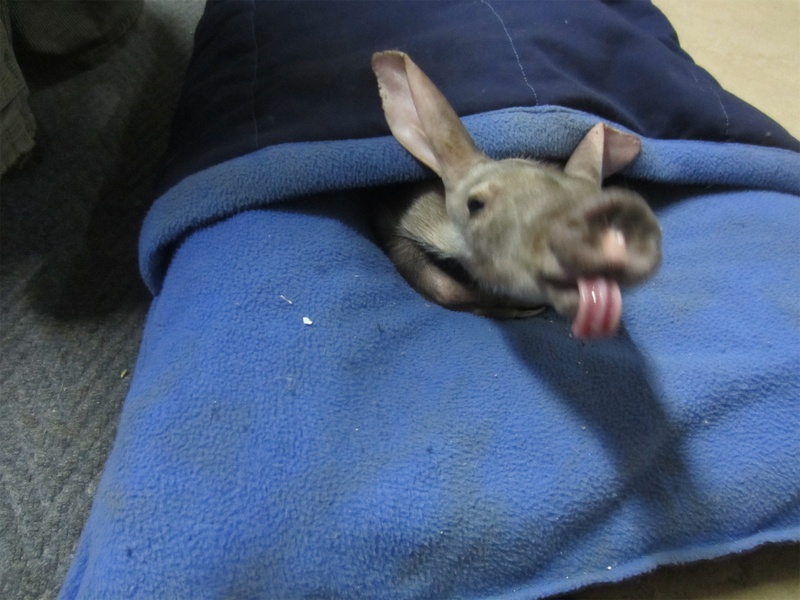 This was the start of the next phase of releasing him back into the wild. 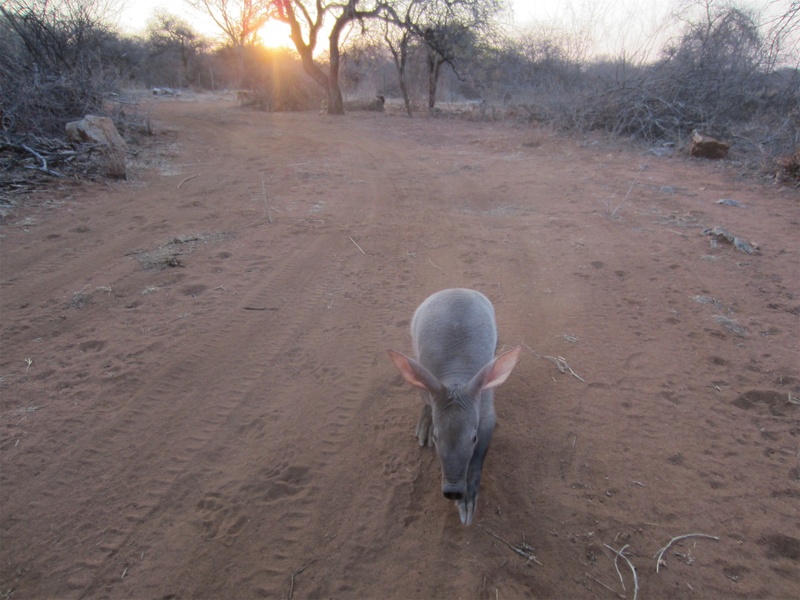 Each morning we would track him and each afternoon we would track him with some food to make sure he was safe. 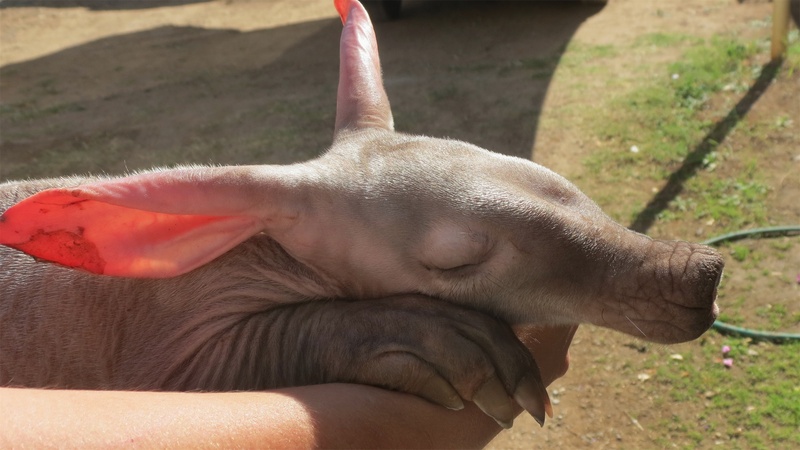 One evening ET came home. 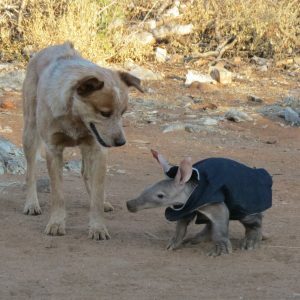 This was a big surprise. 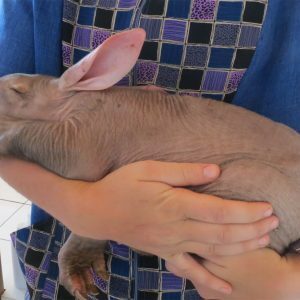 What was even a bigger surprise was that he has been coming home for most evenings since. 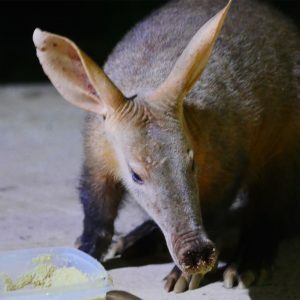 Every time he appears on the porch the magic start, and every time he leaves my home for his home I am a little sad, but proud of him. 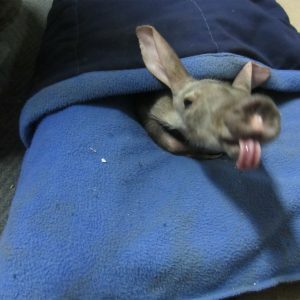 ET has become world famous having been in many publications and in video’s. 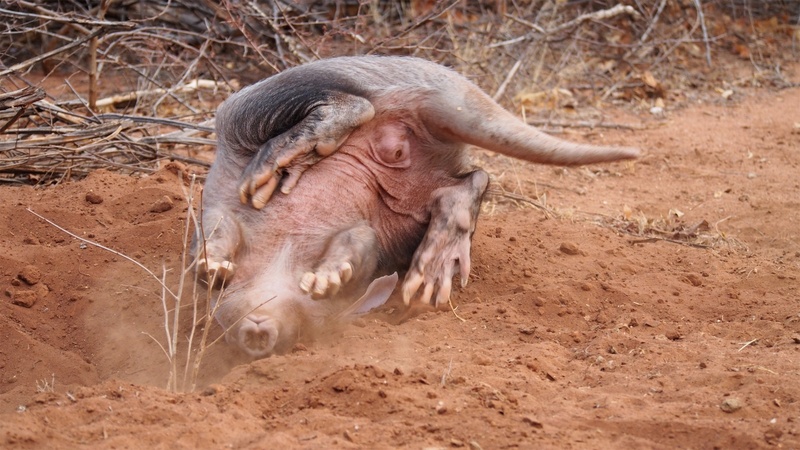 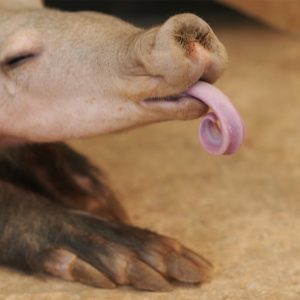 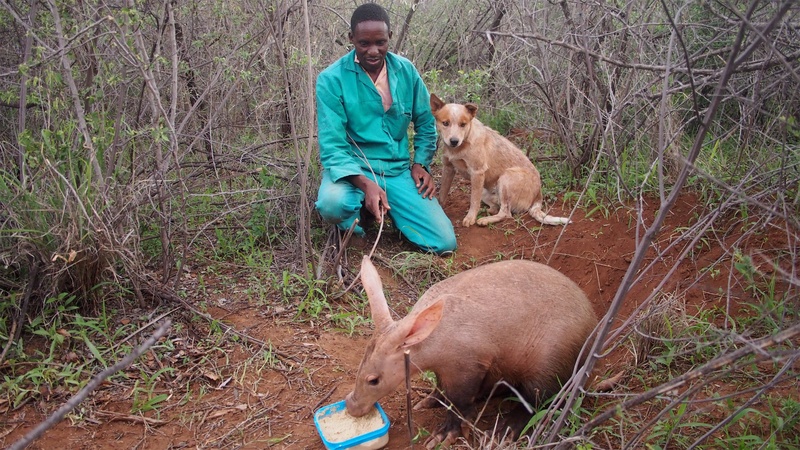 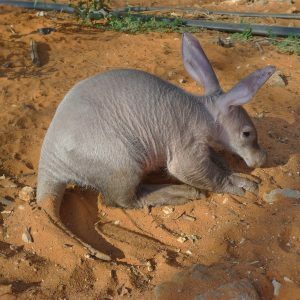 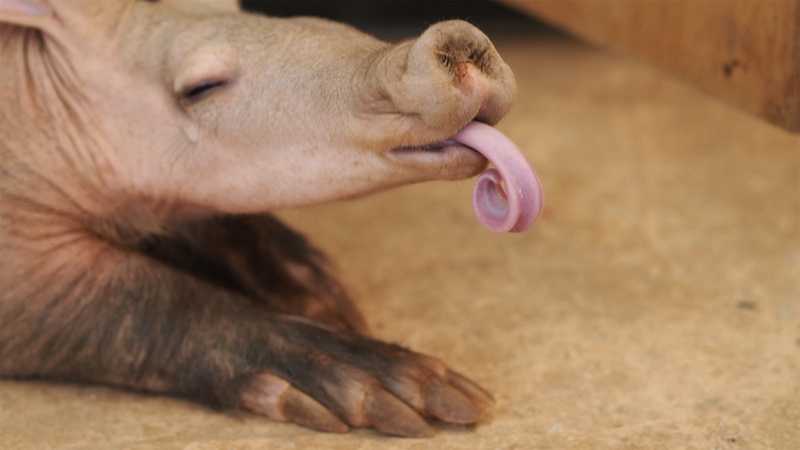 He has certainly been an ambassador for the aardvark species and helped to make many people aware of aardvarks. 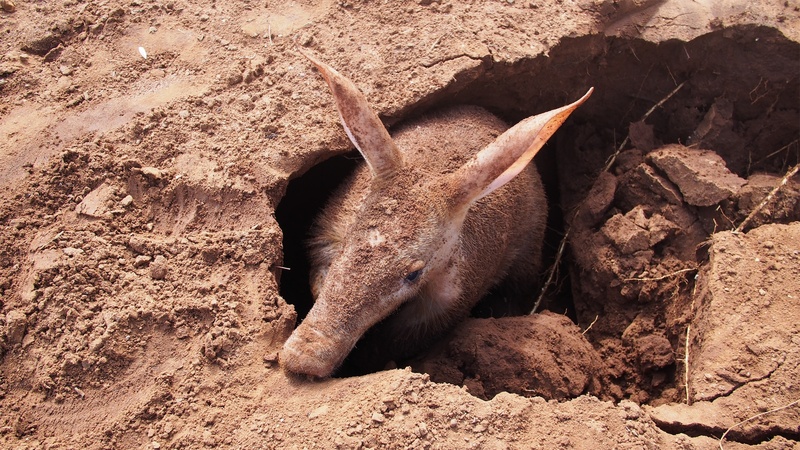 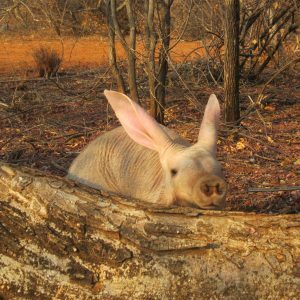 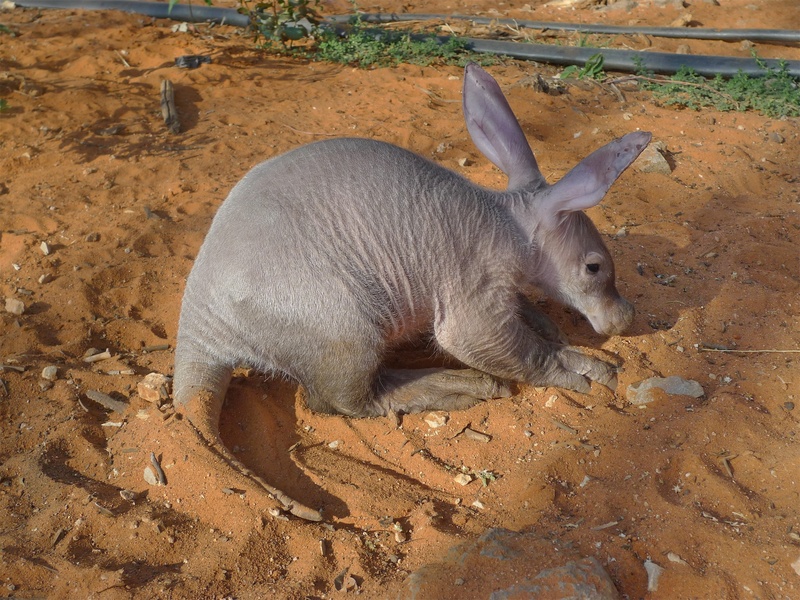 He has shared with us the aardvark ways and hopefully he will continue to help us understand this very shy specie. 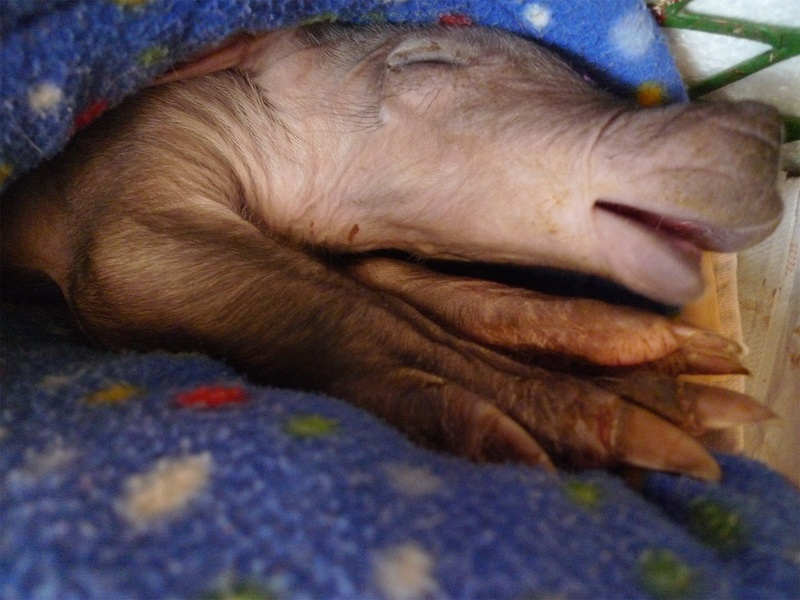 ET has enriched my life and so many people around the world lives as well, and I will be forever grateful to that lorry driver that checked his lorry that morning in September 2015 and to Elke Potgieter who brought him for us to raise and release.